With the many available flashlights today, it can be confusing as to what their differences are. There are LED flashlights, there are tactical flashlights, and there are the 18650 flashlights. When purchasing 18650 flashlights, it’s important to take note of the characteristics to ensure that you’re purchasing something that will make the most out of your money. 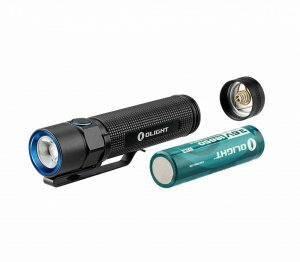 We will talk more about what 18650 flashlights are later on. Whether you are purchasing a flashlight for emergency purposes or tactical, you need to make sure that you’re buying something that is reliable. With the hundreds of 18650 torches on the market today, it’s normal to feel overwhelmed with all the choices. 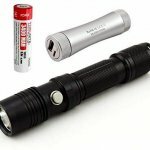 That is why I am here to give you the top 10 best 18650 flashlights available so you can choose amongst them. 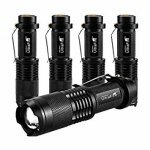 Continue reading below as I share with you the reviews on the best 18650 flashlights today. The UltraFire SK98 adjustable focus flashlight comes with a charger and a 18650 battery. It features a long-lasting LED, which will give you a total of 100,000 hours and a CREE L2-LED with an 800 lumens bulb. This flashlight is consist of five different modes, including SOS, strobe, low, medium, and high. It also has a zoomable feature so you can focus the flashlight’s beam easily. 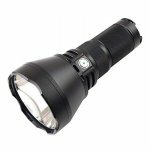 Lastly, this UltraFire SK98 flashlight is equipped with a 18650 battery, which can be charged for a maximum of 1200 times. 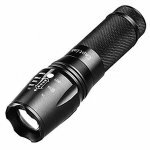 The ThruNite TN12 is one of the most compact and reliable flashlights on the market today. It is equipped with CREE XP-L V6 LED bulb, where it can produce a maximum lumen of 1100 using one 18650 battery. This flashlight is often used by hikers, campers, hunters, emergency personnel, military, and law enforcement. The ThruNite TN12 comes with six modes, including Firefly, low, medium, high, turbo, and strobe. This ThruNite TN12 is made out of aircraft-grade aluminum and is lightweight since it only weighs 86 grams. 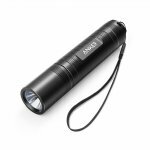 It also prevents scratches because of the hard-anodized finish that this flashlight has. The Skyray 10200 is one of the brightest LED flashlight, which is equipped with a total lumen of 10,200. It has seven CREE T6 LED bulbs to ensure that the flashlight can provide the brightness that you need. The bulbs are known to boasts more than 100,000 hours. When it comes to the body, it is made out of aircraft grade aluminum to ensure its Durability. It is also waterproof which makes this ideal for climbing, camping, and other outdoor activities. This Skyray 10200 is using four 18650 batteries for extra power. It also has four different light settings, which are the strobe, low, medium, and high. The Fenix PD35 Tactical Edition flashlight has a long-lasting and bright bulb. It features CREE XP-L LED which has 50,000 hours of lifespan. The flashlight has a maximum lumen of 1,000 and a 656 feet beam. One of the best things about this flashlight is that it is pocket-sized and lightweight. This means that you can bring this flashlight anywhere you, please. When it comes to the body, it is made out of hard anodized and has an anti-abrasive finish. It is also made out of stainless steel to ensure extreme durability. The body also has an anti-roll and is slip-resistant. With the memory circuit installed, your flashlight will remember the last light mode that you have selected for it. The Anker Bolder LC40 flashlight is pocket sized and is using a CREE LED light with a maximum lumen of up to 400. The beam has the power to reach a minimum of 330 to 600 feet, which will depend on the brightness setting that it is in. It is also three available settings, strobe, low, and high. The LED bulb offers 50,000 hours, which means that it will last for quite some time. This Anker Bolder LC40 has a durable and tough exterior and has an IP65 rating, which means that it is water resistant. It has the power to deal with heavy rain and has a shock resistant so even if you accidentally dropped it, it will still work the same. Lastly, this flashlight is powered by either three triple A batteries or a rechargeable 18650 battery. The ThruNite TN32 has a total lumen output of 1702. Its housing is a copper circuit to ensure that the heat will be appropriately distributed. One of the best things about this flashlight is that it has a total beam distance of 1043. This flashlight has a hard anodized finish and an anti-abrasive, to ensure that it is durable and will last longer. The lens that an ultra clear tempered glass and is anti-reflective. The Captink T6 flashlight is durable and is equipped with several modes. The modes available are strobe, low, medium, high, and SOS. It has a focus feature that’s adjustable and a wide beam. The intense spotlight can reach a maximum of 600 feet, which is perfect for extended range use. If you are going to illuminate a big area, then the circle floodlight will help you. This Captink is made out of aircraft grade aluminum, which has the power to withstand temperatures. It is also waterproof and shock-resistant to ensure that you can use it for survival or outdoor purposes. And to ensure that it won’t fall off your hand even if it’s wet, the grip is textured and has a non-slip feature for security. The ThruNite TN36 Is compact, portable and high-powered, wherein it offers a high-quality beam and an orange peel reflector. The LED has a three CREE-XP-L V6 LED and used four 18650 batteries for a more reliable light. You shouldn’t worry about high temperature because it has an intelligent temperature technology to protect your flashlight. When it comes to the grip, the flashlight has an aircraft grade aluminum for longevity and durability. It has different light modes, including the low, medium, high, Turbo, and Strobe. This flashlight has a maximum beam distance of up to 285 meters. Lastly, it has the power to withstand harsh environments so it will last for an extended period of time. The Hausbell T6-C LED flashlight has a long-lasting bulb and is known to be heavy duty. Its metal construction is comfortable to hold since it has an ergonomic design. You can secure it on your backpack or belt since the flashlight has a waist strap. There are also five modes that can be adjusted, which are the SOS, strobe, flashing, low, medium, and high. One of the best things about the Hausbell T6-C is that it has an adjustable beam and you can do this easily. Another good thing about this flashlight is that it is skid-proof and water resistant, so you can use it almost anywhere and everywhere. Lastly, the flashlight can be powered by 18650 batteries or three triple A batteries. The Wowtac A1S flashlight is pocket size and definitely affordable. It uses CREE XP-L V6 LED to give its users a total of beam intensity candelas of 19,200. It has a maximum beam of 908.7 feet. The tailcoat will help you to turn on and off the flashlight, while the side switch will let you cycle through the different levels, SOS and Strobe mode. 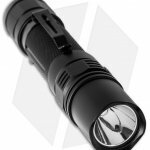 This Wowtact A1S flashlight is made out of AL T6061-T6 and has an IPX rating 7. The impact resistant has a maximum foot of 4.92. Lastly, it has an intelligent memory, anti-slip knurling, and a battery indicator for your convenience. 18650 is a type of lithium-ion battery that can be recharged and is designed for devices that are high-powered. Majority of the flashlights are using 18650 batteries because of the power that they can produce. One of the reasons why people love this kind of battery because it can be charged for a total of 1,000 times. In fact, this battery can last for a couple of years or even more. Also, 18650 batteries come in unprotected and protected forms. When it comes to protected batteries, the battery is protected against overcharge or over-discharge and as well as short circuit and temperature. This just means that they are safer to use. Unprotected ones, on the other hand, don’t have the said protection and can even damage the flashlight. Just like any other rechargeable batteries, the 18650 batteries also have mac rating or milli-Ampere hour. This rating serves as the measurement on how much the battery is discharging for every hour. There are 2400 mAh batteries that may take an hour before it starts discharging. Of course, the lower the milli-Ampere hour, the faster the batteries will drain. 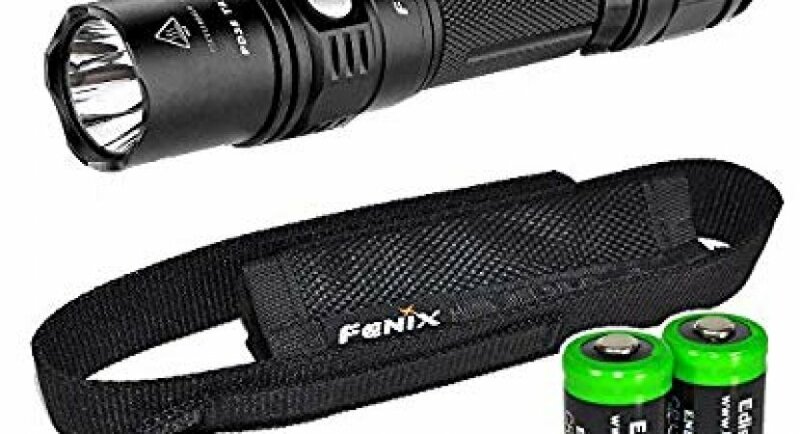 Most survival and tactical flashlights are using 18650 batteries because they can last long, rechargeable, reliable, and of course, powerful. With the many 18650 flashlights, you might get confused as to which one to get for yourself. Below are the things that you should consider when purchasing your 18650 flashlights. The lumens is the light output’s measurement and one that refers to the light’s intensity when it is on its brightest setting. The lumen can vary from 20 lumens, which is perfect when you’re just reading a book at night, or a maximum of 3500 lumens or even higher, which you can use to protect yourself when you’re being attacked. The lumens will depend on the purpose of the flashlight. The run time of the flashlight is essential, which is the measurement on how long your flashlight will last before it starts dropping 10%. There are specific run times for each of the available light mode so you should be aware of this. The brighter the flashlight, the more powerful the batteries are working. The meters, on the other hand, is one that is also called a throw or the distance that the beam can travel from the flashlight to an object before it starts to disappear. The distance of the beam will depend on the brightness mode that you’re using. But always make sure that the flashlight has at least one single setting that can provide you with enough throw when needed. You also need to check the type of bulb being used with the flashlight that you have. Majority of the flashlights today are using LED bulbs since they are known to be a long lifespan. They are more efficient than others like incandescent bulbs. There are three different kinds of beam, which are the adjustable, flood, and the spot. The adjustable beams will let you adjust the beam’s width between the flood and the spot. The flood is consist of a single width and is perfect for simple tasks, including camping and walking. The spot, on the other hand, is also known as the focus and the flood is called fixed. You also need to check I your 18650 flashlight is water resistant especially if you’re using it outdoors. There are flashlights that can be submerged in water temporarily for about half an hours, while there are also one that can be submerged for a maximum of 4 hours if needed. 18650 batteries may look very similar to other types of disposable batteries, but the truth is it’s a rechargeable one, which gives it a significant advantage from others. They also offer features that you will love for your electronic devices, including your flashlight. The 18650 battery has a high capacity to drain, which also means that it can push the lumens up to work best. This will give you the brightness that you need for your flashlight. If you are using this flashlight as a self-defense one, then this will be great because it has the ability to blind an attacker temporarily. The tactical flashlight will benefit from using 18650 batteries. Another feature that 18650 batteries have is the rechargeable one, wherein the battery can be quickly be recharged. This makes the battery perfect for hiking, camping, and any other outdoor activities during the night. Another good thing about the 18650 is that it can be okayed on the recharger while you’re not yet using it. The durability of this kind of battery is perfect since you can recharge it multiple times without any problems at all. The design of the 18650 battery is similar to the disposable batteries, which is good since you no longer have to get to know them again. You can use this kind of battery for any kind of devices and not just for flashlights. In fact, there are now vape devices that use 18650 batteries because they offer high power and are safer. One of the main benefits of using 18650 flashlights is that majority of them have a strobe function. This means that you can use the strobe to disorient a potential attacker to provide you ample time to reach. The attacker will have ample of seconds before he or she can adjust to the brightness of the light that you are going to use. Another benefit of using 18650 is that it helps reduce the peripheral vision of a person. For instance, once you strike the light to your attacker’s eyes, his or her ability to see will be limited. You will have enough time to escape, or you can have a chance to see if there are still other people who are trying to attack you. 18650 flashlights can also be used to defend yourself since they are discreet and compact. This means that even if you drop it or put it out, it won’t actually be noticed unlike guns, knives and any other self-defense tools. Flashlights can be carried anytime and anywhere, so you don’t have to worry about anything at all. You can even pass through security unlike when you’re carrying a gun. This can be a weapon that can help you ward off during dangerous times. Another benefit of 18650 flashlights is that you will be able to see even the darkest areas because of the powerful brightness that 18650 flashlight has. You can spot an intruder or even an animal from afar, so you can reroute. This is an excellent way to defend yourself and as well as protect yourself from any danger. If it comes near, you can use the brightness can you can damage the intruder mentally and physically. 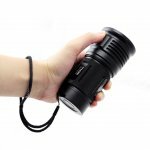 18650 flashlights can help scare away wild creatures and any other animals. The reason behind this is because the effects of bright light on animals can disorient and confuse them in no time. It is harmless to them, so you don’t have to worry about killing them or injuring them fatally. Once you have disoriented and confused the animal, you will have a little time to run and find a safer place for you to hide. One of the most significant benefits of using 18650 flashlights is its versatility. As mentioned above, it can help disorient a person or an animal. It can also be concealed as a weapon to protect yourself against an attacker. Of course, another great benefit is that you can use it to work on something that needs ample light, especially at night. If you are working on your car at night or hiking and you got stuck there during the night, your 18650 flashlights can help you. Having a 18650 flashlight is having a weapon and a guide in one. 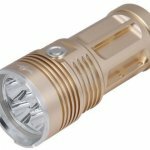 With all that being said, the list of the top 10 best 18650 flashlights above will help you narrow down your options when it comes to purchasing a good 18650 flashlight. With all the benefits of having this kind of flashlight, there’s no need to look elsewhere and choose any other flashlights for your needs. 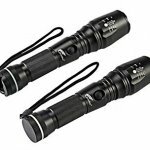 If you are looking for a flashlight that can help illuminate a dark area for you or something that can protect you against attackers, then the 18650 flashlights will surely work just fine for you. Get to know your needs and as well as the features that you are looking for so you can decide which one on the list you need for yourself. Enjoy the benefits of having 18650 flashlights by choosing one that is reliable and definitely durable.